September 1873. Sailors between stints on ships frequently stayed in boarding houses near the waterfront. 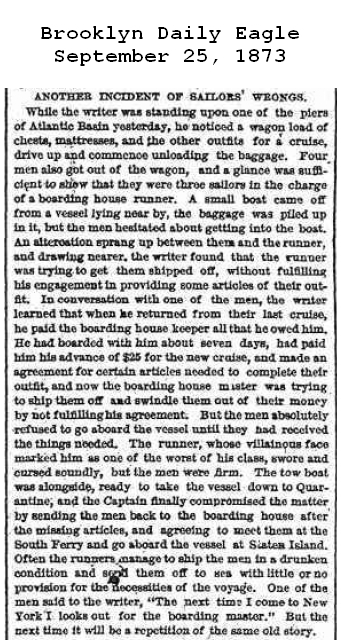 The writer of an 1873 article in the Brooklyn Eagle describes how the manager of certain boarding houses, for a fee, provisioned sailors for their next voyage and shipped them out. All too frequently, as is the case in this story, the manager failed to live up to his obligations and attempted to bundle sailors on to ships without the provisions they paid for. "Another incident of Sailor's Wrongs"